Product Description: This is a mind-boggling book. For the enthusiast intent upon restoring his Corvette to the look and condition it enjoyed when it left the factory, it is absolutely essential. 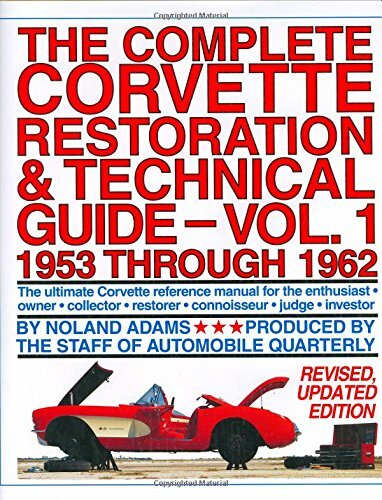 For the enthusiast desiring to learn everything - every detail, every nuance which made one Corvette different from another, at model-year changeover, at mid-model, early model-year production, late model-year production - it is the ultimate reference book. This is the history of what happened to the Corvette on the assembly line from 1953 to 1962. It is the story of every Corvette that was produced for a decade. Its engine. Its chassis. Its body. From Powerglide to Positraction to Power Team Combinations. From ignition shielding to hose clamps to identification labels. From windshield wipers to door latch controls to taillight assemblies. It's a bit like a mystery book too, and could almost be recommended to aficionados of that genre regardless of their interest in Corvettes or even cars for that matter. To write this book Noland Adams had to become something of a Sherlock Holmes.